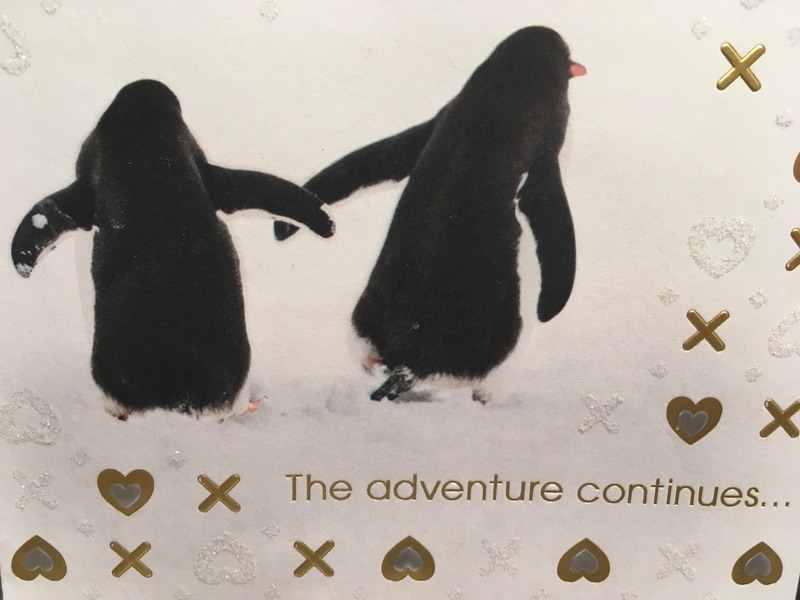 This summer on our wedding anniversary my parents gave us this cute card with two penguins. I displayed it in my bathroom. One day as I looked more closely at the penguins, I started to chuckle. I said, “Nathan, on this card, it looks like the tall penguin is pulling the shorter penguin along.” I found this really funny. I found it strangely representative of this season and this year of my life. Back in the spring of this year, I had a little concussion. I’ve spent several months with my life looking very different. There has been pain, confusion, anxiety and a lot of changes for me personally in how I feel and what I do. At some point in the process, I realized that I was never going to be the same person again. Not really because I thought my whole brain wouldn’t or couldn’t return, but because I had been forced to let go of so much. I then realized that I didn’t want to pick it all back up again. I was going to add more rest into my life. And there were some things that I knew I just wasn’t going to care about anymore. It was, and still is, a little bit scary trying to figure out where I’m going to land on things. I still have some residual effects lingering even now. This has been a season of life where I’ve been that penguin that Nathan has had to just drag along. Marriage is a beautiful and equal partnership of journeying hand in hand. But some seasons require that one person takes the lead more heavily. One person may have to pull the other one along the path in the right direction. They may have to drag the other one. Shoot, they may have to pick them up and carry them part of the way! But the beautiful thing is not being left behind. To have someone that makes sure you stay on the journey and won’t let you check out. To have someone that loves you enough to drag you if needed and not ask you how long that’ll be necessary. To have someone that you trust enough to just resign yourself to being pulled. The adventure does continue. It doesn’t always look adventurous. Some years of life are more exciting than others. Some seasons you spend lots of time laying around watching Gilmore Girls and just getting pulled where you need to go. But what a gift to stay the course and stay on the journey together hand in hand. Sixteen years ago today, on September 11, we heard something on the radio that caused us to turn on the television. I was a young married, and Nathan and I sat and watched on live television while the plane crashed in to the second tower. It was truly unreal. And then we watched, and watched and watched for several days. Our nation became consumed with watching the stories unfold. We heard the stories of heroes, the stories of heartbreak and tragedy, the miracles and triumphs, and on and on and on. It was so much for the heart to take in. We all grieved together and hurt together. And after about a week, I made a decision. I turned it all off, because I just couldn’t anymore. Because I was eight months pregnant with my first child. We had been bursting with excitement for starting our life and our little family. And now a bit of a gloom hung over that. I would be bringing him into this world, and this country, of such current turmoil and sadness. I didn’t know what to do with all of those feelings. I had become consumed with it all over those first few days. I think we all had. I felt all the emotions so deeply and intensely that I was almost physically ill. And that is when I decided that I couldn’t be engaged with it anymore. I had to disconnect and distance myself emotionally. I had grown this precious child for eight long months, and he really needed a few more good weeks from me. I worried that my emotions were going to harm him in some way or force him out too early. I have no idea if there was anything much to this idea, but at barely 22 years old and having never been pregnant before, I didn’t have much experience to go on. So I turned off the television. I quit reading and watching and listening to the stories. I focused on the final weeks of the most important task I was doing. And exactly three weeks later (almost to the hour), we welcomed Samuel David into the world. I spent the days that followed navigating c-section recovery and what it looks like to be a parent. It took us weeks to figure out how to make diapers not leak on the regular. I listened to that baby boy breathe in and out while he slept like it was my job. He was a wonderfully peaceful and beautiful distraction from a nation around us in such despair. Maybe it was that disconnection that allowed me to be braver, less fearful and more confident about bringing him out into the world. In the first year of Sam’s life, we traveled with that precious baby boy by plane on at least six different trips, both domestic and international. Our first trip was to California for some meetings when he was a little more than two weeks old. I was too consumed with protecting our tiny treasure and caring for my post-surgery self to realize that much of the rest of the country was still scared to death of planes and travel. It was just over a month after the horrible events. I didn’t reengage myself emotionally with 9/11 until several months later. I became taken with the story that aired about the children of 9/11. These were the mothers pregnant right alongside me during that time, but who lost the fathers of their children. While I couldn’t even watch the news during the end of my pregnancy, they were actually living the horror during theirs. I could make the decision to turn it off, but they could not. I believe these ladies were some of the biggest heroes of those days. I’ve enjoyed following them over the years, praying for them and admiring their incredible bravery to do such a hard thing.